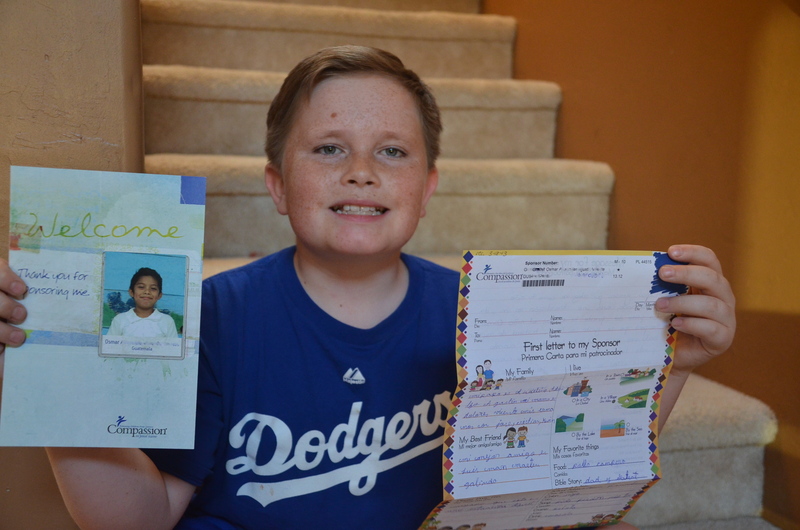 Logan with the first letter from his sponsored child, Osmar. Kids these days – have you ever noticed that they always seem to have their noses stuck into some kind of electronic gadget? Whether it’s a video game, a phone or sometimes both, it seems there is always something demanding their undivided attention. I’m sure it’s always been the same. As my children grow older, it’s hard not to compare them to myself and my friends at their age, just as I’m sure my parents and grandparents did. With so many things distracting today’s kids, it’s easy to worry about the future. It’s hard not to wonder who will see society’s problems and find some solutions. Who will look after tomorrow’s poor? Who will answer the call to look after “the least of these” in a generation that seems so self-absorbed? It turns out, one answer to those questions is living in my house. Last month, my 11-year-old son Logan sponsored a child. He pleaded with me and my husband for days, writing out lists of possible sources of income (chores, birthday and Christmas money), and explaining to us just how dedicated he will be. He promised to write to his child monthly. He even agreed to take on a few extra chores. So we finally agreed that he could do it. Logan headed straight to the computer to search for his child. He pored over the thousands of children available for sponsorship on Compassion’s web site, then narrowed his search to Central and South America. He was drawn to the boys, and soon had written five names on a list. The boys ranged in age from 4 to 12 years old, and a couple of them really were tugging at his heart because of their family circumstances. I told him it would be a good idea to go to bed, pray about his list, and make his final decision the next day. After he finished school for the day, he looked back at each of the five boys he had been interested in sponsoring. One of the children was gone from the site, so he had been sponsored already. Out of the four remaining boys, Logan chose an 11-year-old from Guatemala named Osmar. He decided it would be most fun to have someone close to his age to write to and hopefully to visit at some point in the future. I can’t explain how it touched my heart to see Logan’s joy at sponsoring Osmar. 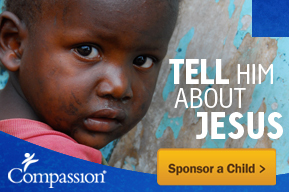 He spent several days reading everything he could find about sponsorship on Compassion’s web site. He wrote a letter to Osmar right away, and has sent two more since then. And today, after five weeks of checking the mailbox daily, Logan received his first letter from Osmar. Now their friendship has begun, and I look forward to seeing where it leads. I’m sure the differences in their lives are many, but like boys everywhere, these two have started off sharing their likes and dislikes with each other. Osmar wrote that his favorite drink is Coca-Cola. Logan’s favorite is Dr. Pepper. Osmar’s favorite color is red, while Logan’s is blue. He writes that he hopes Logan likes his handwriting and promises to try to improve it, already seeking his new friend’s approval. Likewise, Logan painstakingly chooses photos and soccer cards to send to Osmar, hoping to pick things his new friend will enjoy. And with friendship and love growing across borders, it makes it hard to worry about kids these days. This entry was posted in Compassion International and tagged child sponsorship, Compassion, Guatemala, letter, sponsoring. I jumped over from Teresa’s blog and This is amazing! What a joy and what great hope! Love it!! Thank you, Emily! I appreciate your comments. Ok, I’m a bit teary-eyed over here as I read this. I am proud of your son for acting in selfless obedience to God’s voice, and I pray the relationship he builds with his sponsored child blossoms and grows into something beautiful! Thank you for your kind words. I’ll pass them on to Logan. I know he’ll like to read your comments.